txt2fig converts paragraphs of text, into xfig format, fully justified text. This is useful if you want to add a lot of text to your xfig files, as there is no built in way to add multiline text in xfig, never mind justify it. This utility came into existance because all the startard text formatters that could create nicely formated text, were also unable to output eps files with transparent backgrounds. There doesn't appear to be any utilities that can convert an opaque eps file to transparent, so I was stuck. You might think such a program would already exist, making eps files transparent or adding lots of text to xfig files seems to be required quite a lot, yet the utilities just weren't there. This program was born out a quick hack based in bash, that morphed into a larger hack based on awk, which it still is now. 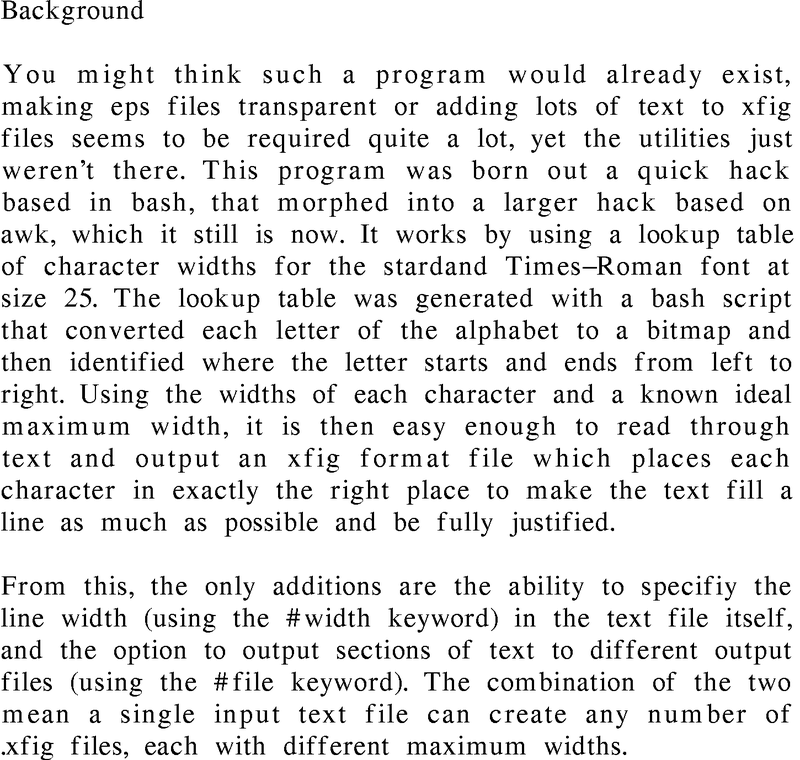 It works by using a lookup table of character widths for the stardand Times-Roman font at size 25. The lookup table was generated with a bash script that converted each letter of the alphabet to a bitmap and then identified where the letter starts and ends from left to right. Using the widths of each character and a known ideal maximum width, it is then easy enough to read through text and output an xfig format file which places each character in exactly the right place to make the text fill a line as much as possible and be fully justified. #width x at the start of a line will set line width from then on to x inches. #file filename at the start of a line will stop using stdout and write the following lines to the given file. txt2fig.awk can be downloaded here. 0. Fix the bug that outputs a header to stdout, even if all output is written to named files. 1. Add all the things that make it whole, docs, man page, examples, rebustness. 2. Find a utility that acheives the same effect and so avoid having to support this program. Initial test release, having written the program I thought it might be useful to somebody else.